My kitchen is on the small side, which means every inch of space must be efficient and tidy. While most funnels are bulky and take up valuable room, this one is compact enough to fit in a studio-size kitchen or be a welcomed addition to any camping pack. The accordion-style pleats not only allow you to collapse the silicone funnel so it fits neatly even in a shallow drawer. The pleats also allow you to adjust the height and width of the funnel for pouring into various-sized containers. 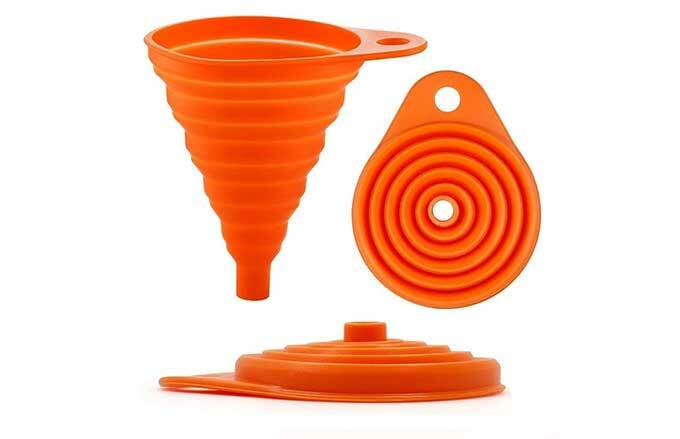 Since the funnel is made of high-quality silicone, it is dishwasher safe and heat and cold resistant, making it more durable and longer-lasting than plastic funnels.